Food scraps create 10% to 20% of household waste and are a burden on the municipal waste system. Garbage disposals are one of the most useful appliances in your kitchen. Chopping up and disposing of leftover food within the existing plumbing system and a minuscule amount of electricity. About 50% or homes in the U.S. have garbage disposals, while only about 6% of the rest of the world does. However, we at Flood Pro want to warn you that poor maintenance habits can lead to mechanical failure and home water damage. Your garbage disposal unit typically lasts seven years at most. Maximize the use of your garbage disposal by keeping it in good operating condition. Run your garbage disposal on a regular basis. Turn on the water and run the disposal every few days. Any leftover food inside could harden, leading to odors and clogs. Use dishwashing detergents that degrease your dishes. Grease is the ‘glue’ that holds bacteria causing odors in your drain pipes and adds to the likelihood of slow draining clogs. Run cold water, not hot, when using your garbage disposal. Hot water melts the food your disposal is trying to grind up, allowing the waste to cling to the sides. Cold water, on the other hand, hardens food and makes it easier for the garbage disposal to grind it up and push it out the drain pipe. Your garbage disposal is only so big, and its blades and motor are only so powerful, so cut waste into smaller chunks. Take your time. After your garbage disposal has finished grinding up the waste, keep it and the water running for a minute to ensure that all the food has been flushed out. Every once in a while grind up peels from citrus fruits like lemons or oranges. The peel will help clear excess waste in the disposal and eliminate any unpleasant odors. Natural acidity helps suppress the bacterial growth associated with odors. Do not use bleach and water to clean your disposal. Bleach will harden grease in your drain lines and is very caustic. Do not grind up potato peelings of banana peels. They will form a starchy paste and stringy fibers to clog the drain. Do not put coffee grounds or eggshells into your disposal. They create very tiny granular waste that will stick to any sludge in the pipe. Don’t put grease, fat or egg shells in the disposal. These will cause the drain line to clog. Dispose them in the trash. Expandable foods such as pasta and rice contain starch which can cling to the disposal. Frequent Resets- If your garbage disposal is in good shape, you shouldn’t need to use the reset button very often. If you need to do, your garbage disposal maybe aging out. Another common cause of frequent resets is loose wiring; have a plumber or electrician to resolve safely. Persistent Odors- Most of the unpleasant smells should respond to gentle and thorough rinsing or cleaning. If nothing seems to help eliminate the odor, you may need professional help. Your plumber can take the appliance apart to find and remove any trapped particles that could be causing the issue. Don’t resort to chemical cleaners when working with your disposal. Not only are most drain cleaners too hard for your plumbing, all of these solvents can damage disposal blades and components. Water Leaks– Over time, water may seep through some of the areas where your disposal connects to the rest of your plumbing system. In many cases, by the time a disposal becomes large enough to be noticeable, it will require a full appliance replacement. These leaks may leave puddles under your sink, pool on the floor by your cabinet, or drip from under the garbage disposal itself. 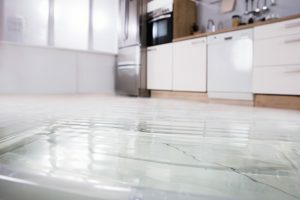 It’s easy to mistake a dishwasher or sink leak for a disposal leak so have a water damage team like Flood Pro find the cause of any leak that seems to be coming from your disposal. Whether your damage is from a busted pipe, severe weather, or leaking garbage disposal, Flood Pro in Aliso Viejo is the trusted water damage restoration team when disaster strikes. If you’re experiencing any type of water damage on your property, call for a home inspection. Flood Pro technicians are trained and certified by the Institute of Inspection, Cleaning and Restoration Certification (IICRC). They will quickly assess the situation to determine the fastest way of drying your property.